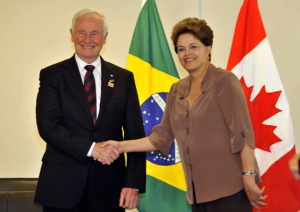 RIO DE JANEIRO, BRAZIL – His Excellency the Right Honorable David Johnston, Governor General of Canada, commenced his first official visit to Brazil this week. The Governor General and his wife, Sharon Johnston, arrived in Brasília on April 22nd, the start of a six-day visit that will make official stops in Rio and São Paulo. The visit to Brazil comes less than a year after Canadian Prime Minister Stephen Harper made his first official visit to the country and is intended to further deepen the working relationship Canada and Brazil have maintained for many years. As Governor General, Johnston, a representative of Queen Elizabeth II in Canada, will be visiting Brazil, Barbados, Trinidad and Tobago promoting diplomatic ties with Canada as well as The Queen’s Diamond Jubilee. During His Excellency’s Tuesday meeting with President Rousseff, the General Governor Tuesday announced that Canada will accept 12,000 Brazilian students at Canadian universities (a number second only to the U.S. participation in the program). Canada is demonstrating a commitment on enhancing Brazilian-Canadian cooperation in the areas that have become the foundation of President Dilma Rousseff’s international platform: science, technology and innovation. The Governor General’s visit to Rio is particularly focused on events highlighting Canada’s interest in developing international education. The Governor General will deliver the keynote address to a select crowd of Canadians and friends of Canada at Gavea-Pontifícia Universidade Católica (PUC). 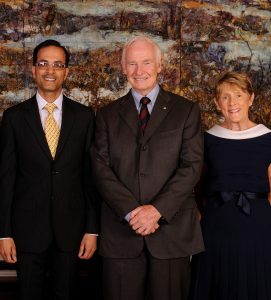 His Excellency David Johnston, Sharon Johnston, and Sanjeev Chowdhury, photo by Consulate General of Canada. Later in the week Johnston will attend the second Conference of the Americas on International Education (CAIE), along with thirty university presidents from Canada, to promote Canada as a preferred partner for commerce, education at all levels, and science, technology and innovation. “Canada is committed to enhancing its education partnership with Brazil. For years Canada has been known as a top destination for Brazilian students interested in studying abroad. The announcement of Canada’s participation in the Science Without Borders program only increases Canada’s commitment to working with Brazil in key areas” mentioned Canadian Consul General to Rio, Mr. Sanjeev Chowdhury. The visit is also intended to further develop the two countries’ work in business and innovation. To this end, the Governor General will attend a roundtable discussion of leaders with a business interest in Canada. “Canada and Brazil are not only well positioned to take on the challenge of developing world-leading products and technologies but can also realize social and commercial value from these collaborative efforts to benefit both economies,” states Chowdhury. While events focused around education are the centerpiece of Johnston’s visit in Rio, the visit will in fact cover many different topics. Ranging from the Governor General’s meeting with the Governor of the State of Rio de Janeiro, Sérgio Cabral, to a cultural visit to the Christ the Redeemer. Johnston’s visit will also focus on exploring how Brazil and Canada, two countries with expansive coastlines and robust maritime economies, can share expertise on ocean science. The Governor General has also expressed a personal interest in learning more about Brazil’s success in the development of alternative fuels ( e.g. sugar cane-based ethanol). “Brazil and Canada have long been friends, the Governor General’s visit is intended to celebrate that friendship as the two countries move into an exciting period of growth and cooperation,” states Chowdhury.